A leaked factsheet gives us a glimpse at thatgamecompany's mysterious "Project 3". A leaked factsheet has revealed Flow and Flower developer thatgamecompany's third PSN title a little ahead of schedule. The game is called Journey, and is described as "an exotic adventure with a more serious tone." You take on the role of a cloaked figure, exploring a huge desert littered with the ruins of an ancient civilization. The game also has a multiplayer element and you can explore the desert with other people that you encounter along the way. "With Journey, thatgamecompany continues its tradition of delivering simple gameplay and accessible controls in a rich interactive environment that invites players to explore and experience emotional chords that are still uncommon in video games," says the factsheet. 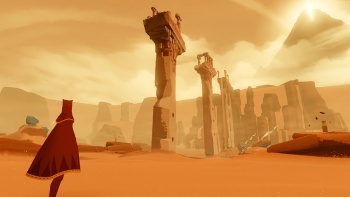 "Journey's innovative approach to online play encourages players to explore this environment with strangers who cross their path from time to time. By traveling together, they can re-shape the experience - creating authentic moments they will remember and discuss with others." The factsheet, along with a bunch of screenshots, found their way on to the NeoGAF forums with no mention of sources or even a hint of how they got there. This seems pretty genuine, but it is a leak, so it's probably best to take it with a pinch of salt.